Shirakawago, Japan is a small town located in the remote Shogawa river valley in Gifu Prefecture. Until Shirakawago, together with Gokayama, was recognized as a UNESCO Cultural Heritage Site in 1995, not many people paid attention to this small farm village tucked in the Japanese Alps. Since then, the historic town is no longer a hidden gem only traveled by Japanese in the know. Now, it is a popular destination that attracts 1.7 million visitors annually. Part 5. Shirakawago Winter Light Up Festival ? So, what is Shirakawago famous for? What is there to do in Shirakawago? Wait, gingerbread houses in Japan? Let me explain. Shirakawago Gassho Village has preserved 300-year-old Japanese farmhouses called Gassho-zukuri. Gassho-zukuri means “hands in prayer” because the roof looks like the praying hands of Buddhist monks. The thatched roof of Gassho houses serves to withstand heavy snowfall in winter while keeping the house cool from the summer heat. Besides its functional and historical values, its triangular shape also gives unique aesthetic characteristics that resemble the Hansel and Gretel’s fairytale house, attracting many Japanese and international tourists. What’s more amazing is that residents have chosen to live in Gassho. Many folk villages I’ve been to are more like a museum that becomes empty when actors in costume go home at closing hours. But Shirakawago Gassho Village is a live-in museum where locals continue with their daily lives. Of course, these houses are somewhat renovated with modern amenities such as electricity and toilets. I’m still amazed by the fact that residents are committed to maintain and live in these heritage houses. Note that 1/14 and 2/11 are public holidays in Japan. Light Up Time: 5:30 pm - 7:30 pm. Shirakawago organizes an annual Winter Light-up event for a limited time. The event usually takes place in January through February during the snow season. I heard that the event used to be held for an extended period in the past; however, it caused many issues for this small village without the infrastructure to accommodate the huge crowds the popular event attracts. I’m not endorsing over-tourism, but if this is on your bucket list, you should pull the trigger quickly before the organizer reinforces more restrictions or potentially closes down (who knows?). And let’s please be courteous when visiting Shirakawago. As I said, locals still live in this village. When I was there, some residents were yelling in Japanese at a rude group of tourists. They were pretty loud and went into residential houses to take photos. (There are some historic houses open to the public. More below.) Can you imagine how disturbing it would be for residents in otherwise peaceful farm village? Before the Light-Up officially kicks off at 5:30 pm, explore the snow-covered village during the day. Without a doubt, it is scenic and Instagram-worthy. While it is a small village, it took me about two hours to make a full circle on foot. I took time to take photos and enjoy the snow. At the Shirakawago station, I picked up a map, which helped me navigate through the village completed buried in snow. As said earlier, the thatched Gassho roof is designed to protect the house from heavy snow. Once in a while, accumulated snow from the roof will slide onto the ground when it no longer can withstand. Be aware that it makes a loud noise as if an avalanche is approaching. I was startled because I had no idea what it was at first and where it was happening. A few Gassho houses have turned into a museum and are open to the public. If you are not staying at Shirakawago farmhouse, this is the second best opportunity to look at how residents live in the historic home. Wada House: The Wada family was one of the wealthiest families in the village. This house is the largest Gassho farmhouse in town. Kanda House: Located in the center of the village, this is one of the best-preserved farmhouses. Nagase House: The Nagase family were doctors. This farmhouse displays medical tools as well as farming tools. I visited this house (see photos below). If you want to fully experience Gassho, or choose to stay in town for Winter Light Up, you will be delighted to know that a farmhouse stay is an option. A handful of Japanese farmhouses in the village is open for homestay (“Minshuku” in Japanese). The experience would be somewhat between hostel and Japanese Ryokan stays. Guests can expect to sleep on futon beds on the tatami mat and share a bathroom with other guests. Breakfast and dinner are served with the local dish, similar to kaiseki ryori at a traditional ryokan. I imagine it to be a simple lodging but a great cultural experience. See below Where to Stay in Shirakawago for booking details. If you would like to see the illuminated view of the entire village, then plan to go up to the observation deck (Shiroyama Viewpoint). While the viewpoint is 15-min walk up the hill from the village center, the walking trail is closed during the illumination event. Instead, visitors are asked to take a shuttle bus.Usually, you can get the shuttle bus tickets (200 yen, payable in the bus) near the Wada House. However, in winter, walking to the observatory is forbidden due to safety concerns. During the Shirakawago Winter Light-Up event, it is required to reserve your ticket and pay in advance (1,000 yen per ticket) via Shirakawago Tour Association’s website. Some tour packages include a ticket for the shuttle bus, so check with your tour company if you choose to travel with a tour group. If you are heading to Shirakawago for Winter Light-Up, you should plan early and thoroughly. In 2019, the organizer is limiting public access through the reservation system. Only 1,700 people will be allowed at the observation deck and 580 inside the village. To reserve your spot or for more details, visit the official Shirakawago Winter Light-Up website. Store your luggage in the coin locker inside the Shirakawago bus terminal. Don’t even think about dragging that luggage into the village because it will be challenging to do so. Space is limited; however, it shouldn’t be too bad as most tourists keep their bags in their tour bus. Pick up a map at the terminal. Shirakawago Gassho village is small enough to explore on foot. But it is easier to navigate if you have a map in hand. Don’t rely on Google map as wi-fi reception is weak. Check the boarding time before leaving the terminal. Japanese are punctual. Whether you are back or not, the bus will leave on time. If you miss your bus, you will most likely be stranded without lodging and alternative transportation as they are completely booked during the illumination festival. Make sure you give yourself enough time to walk back to the station then get your luggage from the locker. Public restrooms are available in town. Don’t be pressured to use the restroom at the terminal. There are public restrooms available throughout the village although the line can be long. Prepare yourself with appropriate winter gear. Temperature drops below the freezing point even during the day. Appropriate clothing and protections are highly recommended, especially for those planning to stay overnight to fully participate in the Winter Light Up. See how I packed, prepared and survived the record-breaking cold winter in Japan. Bring a plastic bag with you. All guests are asked to bring home any garbage they created. No one checks on you whether you follow through or not. But as responsible travelers, it is least we can do to help relieve the beautiful small town suffering from over-tourism. Tokyo to Shirakawago: Take JR Hokuriku Shinkansen to Kanazawa, then take a Nohi bus to Shirakawago. Nagoya to Shirakawago: Take JR Hida limited express train to Takayama, then take a Nohi bus to Shirakawago. Osaka (or Kyoto) to Shirakawago: Take JR Thunderbird limited express train to Kanazawa, then take a Nohi bus to Shirakawago. Kanazawa to Shirakawago: Take a Nohi bus from Kanazawa to Shirakawago. Takayama to Shirakawago: Take a Nohi bus from Takayama to Shirakawago. Toyama to Shirakawago: Take JR Hokuriku Shinkansen from Toyama to either Kanazawa or Shin-Takaoka, then take a Nohi bus to Shirakawago. Purchase your JR Pass here. Here is the link to check Shinkansen timetable. (I recommend this site because it supports in English and easy to use.) You can check schedule and make a Nohi bus reservation here. If your trip is limited to the Hokuriku region, there are a few other great discount passes for international travelers. However, if you’re flying in and out of (or traveling to and from) other cites outside of this region, most likely it would be more cost-effective to purchase a JR Pass. Foreign nationals can take advantage of Takayama Hokuriku Tourist Pass. This pass provides unlimited access to JR trains and buses in the Hokuriku region. Similarly, the Shoryudo Highway Bus Ticket is exclusively available for foreigners. The 3-day pass provides unlimited access to designated buses to cover travels between Kanazawa, Toyama, Takayama, Shirakawago and Nagoya. However, if you like to travel on your own term, like me, you will be disappointed to learn that it is NOT possible to participate in the light-up event without joining a tour group or staying overnight at Shirakawago Minshuku (or guest houses). That’s because the last bus on a regular schedule depart Shirakawago before the illumination starts. Don’t be disappointed yet, though. During the Shirakawago Winter Light Up event, the special Shirakawago tour packages and special bus tours are available. Takayama to Shirakawago: Nohi Bus tour offers three programs to Shirakawago to serve the route that normally would not be available. This is the only bus tour program with an option for a traditional dinner plan. Toyama to Shirakawago: Toyama Chihou Railways offers two round-trip bus plans - with or without shuttle bus tickets to the Shiroyama Viewpoint (a.k.a. observation deck). Takaoka to Shirakawago: Kaetsunou offers three bus routes from Takaoka Station. Travelers staying in nearby cities might want to travel by taxi. Make sure to reserve a taxi through your hotel in advance. We stayed at Takayama on Shirakawago Light-Up event day. There was no available taxi in the entire town as they were completely booked for guests visiting Shirakawago. Also, note that Japanese taxi fare is among the highest I’ve seen in the world. It would be wise to get estimates when you book. Note that reserving a parking pass is required for everyone traveling on a taxi. Takayama to Shirakawago via Taxi: Nohi Bus also offers two Shirakawago Illumination Display Taxi plans. The plans include taxi fare, parking pass, tolls and shuttle tickets to the observation deck. Fares are 60,000 yen up to 4 passengers/car or 83,000 yen up to 8 passengers/car. Book a Nohi Bus Shirakawago Light Up Taxi plan here. Private tour from Takayama: This private tour offers a local driver and chartered vehicle with an option of an English-speaking tour guide. Hotel pick-up service is offered from Takayama hotels. Book a private tour from Takayama here. If you are not local, I would not recommend driving your rental car in winter for the safety reason. Not to mention the Japanese vehicles drive on the left side of the road, which is the opposite side to most of the countries, the road conditions require some serious winter driving skills. However, if you are determined, you could drive as a last resort. Because the village is tucked in the heavy snow regions in the Japanese Alps, you will need to have snow tires and other gears necessary for the slippery road. Also, keep in mind that the mountain roads to Shirakawago are narrow and often congested during the event. Parking space is limited. A non-refundable parking pass must be reserved and purchased in advance. It goes on sale on Oct. 10, 2018 for 2019 tickets. It costs 3,000 yen for a regular passenger vehicle and 5,000 yen for larger vehicles. I’m not surprised there is no hotel in Shirakawago. After all, it is a UNESCO heritage site with 300-year-old houses. Regardless, you can find a few accommodation options in Shirakawago and nearby cities like Takayama. 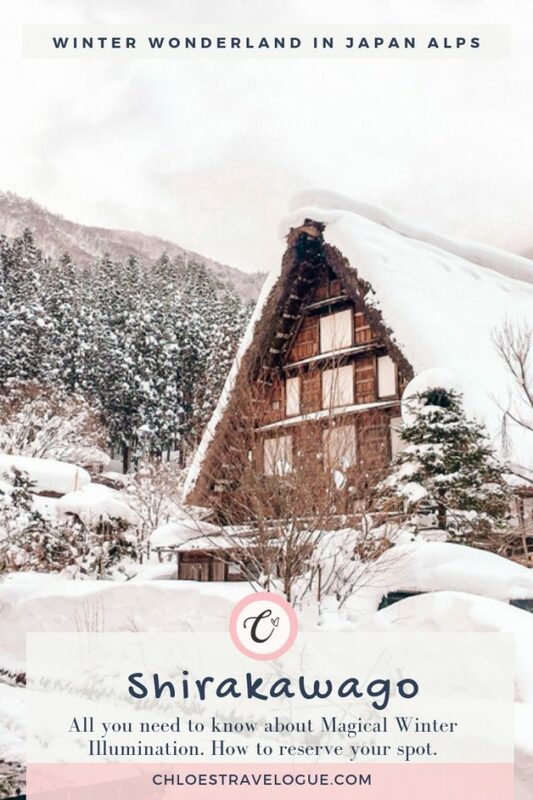 If you are curious about how it’s like to live in Shirakawago Gassho houses, you CAN fully experience it by staying at one of them! Or, there are a limited number of guest houses in Shirakawago. These options sell out very quickly for Shirakawago Light Up festival days, so book in advance. Nearby city Takayama has more ryokan or hotel options. Keep in mind of the limited availability. For the Winter Light-up, booking opens from mid-August on a lottery-based reservation system. Overnight visitors get the first dip at parking passes and shuttle bus tickets to the observation deck. The reservation can be made through the Shirakawa-go Tourist Association or Japanese Guest Houses. Make sure you reserve your festival spot first. Then, you can plan transportation and accommodation accordingly. If you have a difficulty handling transportation on your own, it’s a good idea to book accommodation then reach out to your host to help reserve transportation. It is possible that you will not be able to reserve your spot for Shirakawago Winter Light Up. Good news is that you can still visit Shirakawago and enjoy the scenery on your own. If you are debating whether it’s worth to visit or not, the answer is yes in my opinion. Although the reservation system was not reinforced yet in 2018, I was not able to participate in the official Light-Up event. I was still able to access the village and freely roam around on one of the Winter Light Up days. However, due to the reservation system in 2019, you will have lots of limitations without reserving your spot. Therefore, I recommend visiting Shirakawago on other days during the snow season! Gokayama is another UNESCO Cultural Heritage Gassho village near Shirakawago. As the entire region typically enjoys heavy snowfalls in winter, the scenery here is similar to Shirakawago. The town is even smaller and less-traveled than Shirakawago. If you like to avoid the crowds, you might like the more intimate environment in Gokayama. On the other hand, Gokayama is a bit more challenging to get to via public transportation as you will need to transfer in Shirakawago. Check the World Heritage Bus schedule by Kaetsunou Bus here. Hida/Takayama is a town close to Shirakawago, which takes about one hour by bus. As Shirakawago doesn’t have enough accommodation for every visitor, many travelers choose to stay in Takayama. I ended up at Takayama hotel as well. If you somehow miss out on Shirakawago Winter Light Up, you will be glad to learn that Hida Folk Village (Hida no Santo) is illuminated every day from 5:30 pm to 9 pm in mid-January through mid-February. For more information, visit Hida Folk Village official website. Hida Folk Village is located in Takayama city, 10 min by bus from Takayama Bus Center next to JR Takayama Station. Just like Shirakawago, the village features gassho farmhouses. I’d imagine the scenery would be similar. If you opt to visit Hida Folk Village on Shirakawago illumination event dates, make sure to book bus or taxi in advance. I had to miss this event as well because all the taxis in town were reserved for the Shirakawago event and our timing, unfortunately, didn’t work out with the bus schedule. Kanazawa Castle Park Light-Up is not a Gassho-zukuri farmhouse illumination event, meaning the scenery will be much different. 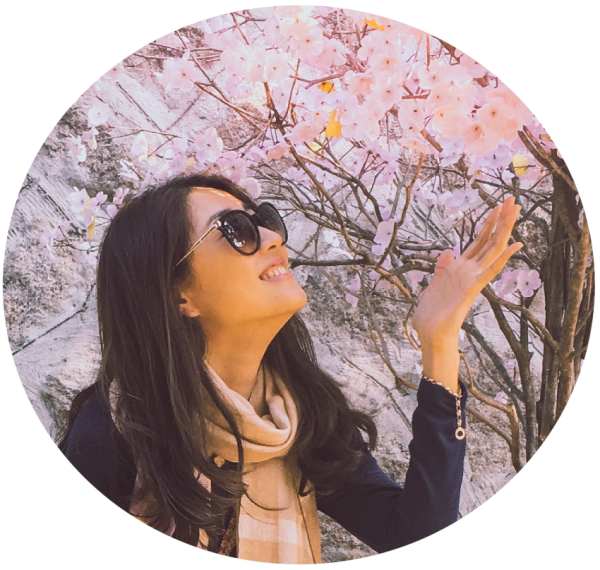 However, if you can’t secure the spot for the Shirakawago event and are staying in Kanazawa, visiting Gyokusen ‘inmaru Garden or Kenrokuen Garden would be a great alternative. For more details, read my Kanazawa Japan Guide. *** ENJOYED THE POST? PIN IT!